Thank you for your email inviting me to your marketing event. Actually, to be fair, it wasn’t from you. The emails were from MS&L Worldwide, the company handling marketing for your marketing event. And thank you for your second email three days later from another person at the same marketing company inviting me again to the same marketing event. I guess that’s what you mean by “aggressively represent the interests of our clients”. Maybe that’s what won you your Silver Anvil Award. How else can you deliver “measurable business results for many of the world’s largest companies and most successful brands, including … General Motors“? Your 70-year-old company whose history seems to be nothing but corporate merger after corporate merger, is clearly in the best position to do this kind of marketing. Especially when you’re doing marketing of a Canadian event from your office in Ann Arbor, Mich., instead of Toronto (or, say, Montreal). Such a big firm, I feel a bit silly doing this. But can I offer a few suggestions for future marketing campaigns? Both emails begin with “Hi Steve”. Why are we on a first-name basis? We’ve never met. Is it because you don’t take bloggers seriously? Is it because you so desperately need to sound like you’re part of our demographic that formalities have been deemed undesirable? You constantly refer to the brand name NESTEA® in capital letters and with that R symbol (except for that one time you accidentally used the French “MD”). Are you afraid I’m going to steal your brand or something? Or worse, decapitalize it? You’ve invited “pro athletes” (actually Olympic snowboarders, does that qualify as “professional athlete”?) and Sam Roberts to your event. I think the Virgin Festival at Jean Drapeau Park has you beat on the guest list. They’ve got New Kids on the Block and Jonathan Roy! You’ve linked to your Twitter account, which has only a single update pointing to your press release. It’s a wonder you only have six followers. Your corporate hash tag also doesn’t inspire yet. You use the word “awesome.” You seem to be very attached to this word, judging from your forgettable Flash-based product placement video game. What 50-year-old middle manager decided that using “awesome” and “ultimate” would appeal to us? Both your emails conclude with the standard corporate disclaimer boilerplate text, suggesting that I can’t divulge its contents if I’m not the intended recipient. Should I email back to confirm that I’m the intended recipient? Maybe it was meant for some other Steve? You link to your Facebook page. Actually, you don’t. You link to it from your Twitter account and tell me to search for it in your email instead of just including a link. I took a peek, and noticed that there are lots of questions from the public on that page (click on “Just Fans” on the Wall), and none of them have answers. Your Facebook event page also leaves lots of questions unanswered (though you do repeat many times that it’s free). Your event doesn’t have a website. Or at least none that I could find. I had contemplated taking you up on your invitation of free food (I’m not crazy about skiing or snowboarding) and discovering just how such giant marketing events work, how spending so much money could “impact behavioral changes” enough to justify the expense. Unfortunately, I’m working on Saturday so I can’t make it. Besides, this is more fun. And I can keep my dignity. And I don’t really care for iced tea. p.s. Building a snow hill in summer? That’s crazy. I should blog about that. I was busy at work today putting the sports section together (apparently there was this tennis match or something), so I didn’t check my non-work email until I got home. I came back to find 17 new messages in my inbox, which is unusually high. A lot of them were delivery failure messages, which made even less sense. Looking through them, it was obvious someone was sending out spam mail with a forged address at my domain. I foolishly setup a catch-all for that domain so everything goes to me. None were angry messages professing eventual death, which was nice. Some were away-from-my-desk messages, others were anti-spam confirm-you’re-a-real-person messages. The rest were bounces. Then I looked in my spam box. There were hundreds of bounces. At least 300. Thankfully I have Gmail, so cleaning that up was pretty simple. UPDATE: I wake up, and the same thing happens again. In all three cases, I can only theorize about why my email was added to these marketing lists, because not one of them responded to repeated requests for an explanation, the first as a regular spam victim, the second as a reporter researching a story. CIBC’s media relations guy asked for more information about the email, but I never heard from them or their email services provider Komunik again. Indigo’s email followed what has apparently become an industry standard of having people fill out web forms before they can unsubscribe from email lists. And like other companies, it assumed I have an account and wouldn’t let me unsubscribe unless I logged in. But Indigo responded promptly to my initial complaint with a thorough investigation. Well, actually ThinData found a blog post I wrote with the complaint and then alerted the company. Within two days I had a response from Indigo’s customer service director explaining that someone else (my mother) had used the address to set up an account in 2005, and they have “only recently been reaching out to our past customers.” He unsubscribed me from the list and apologized for problems I had unsubscribing. Both Indigo and ThinData provided copies of extensive privacy and anti-spam policies. That last part sort of irked me. Despite promises that they’re 100% against spam, these companies seem to defer to their clients when it comes to actually determining whether policies are being followed. Explanations are accepted at face value and no independent investigations are done. The article also includes some suggested best practices for commercial email marketers, compiled from industry sources and the Canadian Task Force on Spam. Hopefully some companies will be a bit more strict about conforming to them. I’ll let you know if any of these companies decide to respond now that the article is out. In the meantime, do you have any spam gripes about companies that should know better? Appels Sortants Locaux et Interrubains Illimites a partir10$/Mois! Unlimited Local and Outgoing Calls for 10$/month! I have, of course, never even heard of this outfit, much less had any business dealings with them that would give them the impression that they could text-message-spam me. I’ve requested an explanation and will update this post if I get one. In my ongoing fight against spam, I tend to give local businesses a bit of slack when it comes to netiquette. They’re small and inexperienced, so you might forgive them for minor glitches. Le grand solde Kanuk bat son plein jusqu’à lundi 12 novembre. C’est le meilleur moment pour choisir votre manteau chaud Kanuk. Chez Kanuk, au 485, rue Rachel Est à Montréal. pendant le Solde d’entrepôt Kanuk. As usual, I’ve sent them an email and will update if and when they respond. The email was sent through Canadian B2B Internet service provider Radiant, which should also have better measures to prevent such things. Going through my spam folder again today, I noticed an email from Rogers, my wireless provider. It was a promotional message (as opposed to the one I get every month telling me my bill is ready) announcing, and I kid you not folks, that they redesigned their website. Since I’m not a fan of spam, especially from large companies that should know better like Chapters/Indigo and CIBC (the latter — a bank — has still not responded to my request for an explanation beyond assigning it a support ticket number), I couldn’t let this one go without mentioning it as well. The big difference here is that I am a Rogers customer, so they didn’t harvest my email or take it from an old form gathering dust in their basement. But I call it spam because I never asked for it and it’s purely promotional in nature. The email is not personalized, even with my name, violating one of Rogers’s own anti-fraud policies. Further complicating matters is that I’m invited to click on image links that bring me to addresses that start with http://mailtrack.rnm.ca… (which redirects me to a Rogers website). Clicking on links to visit the “new” Rogers.com brings me to this horribly-designed web page which asks me to choose my province (and language). Don’t they already know this information? They provide me wireless service after all. Like a lot of these messages I see, there’s a tiny link at the bottom for people who want to “opt-out of future email communications” (which I can assume implies I never opted-in in the first place). That link brings me to a login page. Once I login, I’m brought to the standard homepage with no clue given on where I should go to opt out of emails. I’ve looked around for about 10 minutes now and still haven’t found it. I’ve had to login three times browsing the site. And now they’ve just suspended my account for 24 hours because the password I used 5 minutes ago is no longer the right one. Oh wait, it hasn’t. My previous login is now still valid. Top-notch security there, Rogers. There’s no difference between the “new” Rogers website and the old one, except for a few trivial changes. It looks exactly the same. The entire purpose of the email is put into question. I’ve filled out an “abuse” form and emailed the sender of the email message asking for an explanation of how I got this email. I’ll update if I get one. I was going through my junk mail folder and I came across an email from CIBC whose subject line is in French. French-language spam is pretty rare, so I tend to give it a second look. Turns out it’s a legitimate CIBC email (they have a copy of it on their website) having something to do with their VISA card. And just like the Chapters email I got last month (their email provider promised to get back to me “ASAP” but I never heard from them again), it’s something I never asked for, sent to an address that gets just about nothing but spam, from a company I’ve never done business with in my entire life. Neither I nor anyone in my family does banking with CIBC, and I have no idea how they would have my email address. 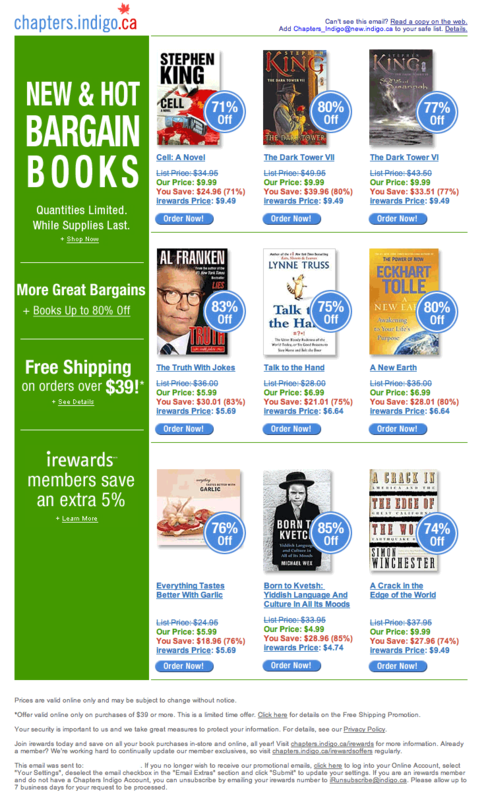 Like I did with Chapters, I checked their unsubscribe process. The link sends me to this web page which asks for, among other things, my name, phone number and last four digits of my CIBC VISA credit card. All fields are, of course, required. The URL for this page starts with www.email.cibccards.com. Sounds kinda phishy to me. The fact that they ask for part of my credit card number based on an unsolicited email makes this even more worrisome. It’s encouraging bad habits and horrible security practices. Why is anything beyond my email address needed to unsubscribe from a mailing list? I don’t have a CIBC VISA credit card number because I’m not a CIBC customer! Since they require information from me that simply doesn’t exist, I can only conclude that it is impossible for me to unsubscribe from this mailing list. Considering that this message seems to clearly violate CIBC’s own anti-phishing policy, as well as being outright spam, I’ve sent them an email asking for an explanation. I’ll update this post if they provide one. I’ve copied the email to Komunik, makers of Konversation, the CIBC’s email marketing provider, demanding to know how they don’t consider this spam. At first I thought it might be a phishing exercise, since I’ve never received such an email before, I haven’t shopped at Chapters/Indigo in ages and I certainly never gave them an email address I haven’t used in about as long. But there was no “your account will be deleted within 24 hours” warning nor any request to log in. A few quick clicks confirmed that the email did in fact come from the organization. I might be able to forgive a small-time local outfit who sent out a quick ad for itself to people in the CEO’s address book unfamiliar with netiquette… 10 years ago. This is just inexcusable. I did absolutely nothing to request this email. My best guess is that they dredged up their archives from years ago and just harvested the email addresses assuming no one would complain. The unsubscribe process adds insult to insult. You’re asked to “sign in” using a password that you don’t know because you never signed up with them. You then go to the “forgot your password page” and input your email address. Then you click “submit” and … nothing happens. No confirmation page. No email with your password. You’re stuck on this list forever. I have sent Chapters/Indigo an email demanding an explanation. I have also contacted Toronto-based ThinData, as the email was sent through their servers. I will update this post if one is given from either company. UPDATE (9:30pm, 4 hours later): I’ve received an email from a VP at ThinData asking me for a copy of the email I received (do they not keep copies of the mass commercial emails they send out?). The email, naturally, came not after I emailed them as an irate web user but after they discovered this blog post. He promises to look into the matter “ASAP”. Sell your replica watches for no money down to get viagra enhancement in free adobe software! So looking through my emails, I notice that Hollis’s boyfriend keeps slipping out of her, while Mindy’s boyfriend’s horse-like shlong is too big for her. Maybe Mindy and Hollis should swap boyfriends.